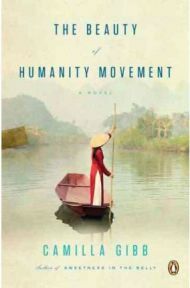 The Beauty of Humanity Movement by Camilla Gibb is set in Vietnam, a country which I know relatively little about. One of the strengths of the novel lies in providing an overview of recent Vietnamese history, specifically relating to the transition from a colonial state to a communist state and subsequently modernisation. In addition to providing this overview of historical events, Camilla Gibb conveys a strong sense of what it must have been like to live in Hanoi during this period, with its crowds, poverty, sights, tastes and smells – a vibrant, modern city seeking to reinvent itself after a troubled past. The central character of the novel is Hu’ng, who has been a witness to all of these events. We meet him first as an elderly man who scrapes a living selling pho, a traditional Vietnamese noodle soup, to a small band of loyal customers. (There is a lot about pho in this book – it sounds delicious and is definitely now on my “to eat” list.) Gradually it emerges that Hu’ng in the past has been closely associated with a radical group of artists and poets who were violently disbanded at the beginning of the communist era. As the novel proceeds, we learn gradually about his early and subsequent life, in particular his attempts to preserve the memory of the poet Dao and his flawed relationship with a young woman, Lan. In parallel with this story, Maggie Ly, the daughter of one of the renegade artists, has been brought up in the US and has now returned to Hanoi as a curator, trying in her spare time to discover her father’s personal history which has been lost to her. She is aided in her search by Tu, who has been adopted by Hu’ng and views him like a grandfather. These strands and others come together in a convincing way. The problems that arise whenever principals are put ahead of relationships is a recurrent theme. A number of the characters do this and regret what they have lost as a result, trying to reverse their decisions at a later date. However, the clock can never be turned back successfully, and what has been lost is lost forever. At first it seems as if the various strands will be neatly drawn together to a satisfying romantic conclusion, but life is more complex than this and so is this novel. Events move fast towards the end, and I had the sense of a novelist running out a time and space and seeking to draw everything to a conclusion quickly. The end was not quite up to the promise of the beginning, but overall this is an interesting novel, which gently educates about Vietnam while proving very readable. No Comments on "The Beauty of Humanity Movement"